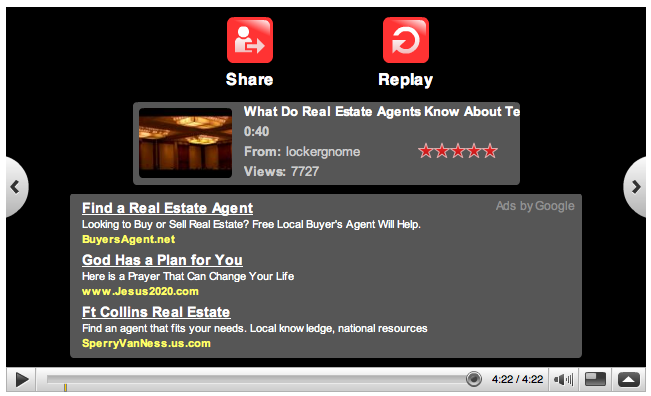 Many of us use Youtube to host a variety of Real Estate and personal videos. I noticed that when videos are done playing, in most cases, other videos will pop up on the screen that have a similar topic or title. Does this hurt or help you? I guess this depends on how you “see” it, no pun intended. Having a video on your site or post can certainly help to create a more captive audience, but those next videos that pop up may be having a subtle and adverse affect. So how do you prevent your competition and others from coming up on “Your” Youtube videos? Hopefully this tip will help prevent this from ever happening to you…ever again. When using Youtube Videos on your Blog posts or sites, you might want to take these next steps and precautions before pasting that object embed code. I’ll use these screen shots below as examples in hopes this makes more sense. When you get or use ANY video from Youtube, there are some options available you may not be aware of. This will come in very handy if you’re uploading your own or using any videos from youtube. When you create or find the video you wish to link or embed into your site, you’ll see these options available located on the right side of the video. There is a tiny graphic just to the right of the embed code (a settings gear) that little blue thingy that probably 90 percent of people never see. Click On it! This allows you to customize and make changes to the video and player. This is the culprit right here. 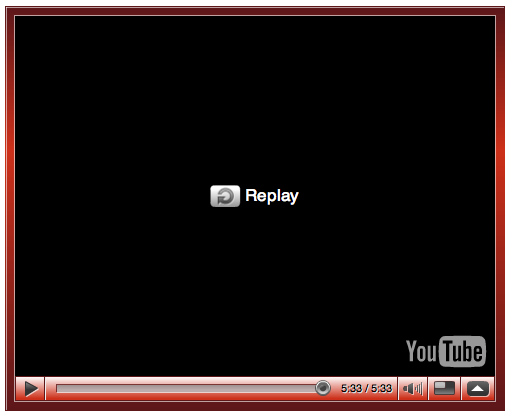 If you leave that box checked, you’ll have no control over what shows up after your video plays. If you leave it checked, you’re taking a chance on having some videos pop up that might not “Best represent” you, your Blog or the site it’s being seen on. This is happening with and to millions of videos, and they call it viral. Can you see why now? Once you get this out of the way, you can also customize your Video by changing the size and adding a custom border. Just click on that “settings” graphic and it’s all there. I suggest the 445×365 or 500×405 for ActiveRain Blogs. Only copy the embed code for your video “AFTER” you have completed these steps, that is unless of course you don’t mind what videos come up after yours. The video below is my 13 second claim to fame. It’s short, raw, and took me the least amount of time and effort to create other than getting to the place where I shot it. Because it is titled “The Glory Hole” or “The Black Hole” you can imagine some of the other videos that would pop up in the viewer after mine. :-O I sure didn’t want Mom to see some of those other videos that were supposedly related. Yikes! We won’t go there today. This little video has had over half a million views with nearly 1000 comments. Question is, where did they go and what did they see after mine…or YOURS? This is what might happen to some of your “Rain Making Efforts” if you’re not real careful out there….